I have so many attachments that need to be devastated and destroyed for the rest of my life. Attachment to being victimized. This relates to my sense of identity and my difficulty in being independent and not caring about what others think. Attachment to other people whom I have a deep desire to help spiritually out of love for them. Letting go of the fear of loneliness. 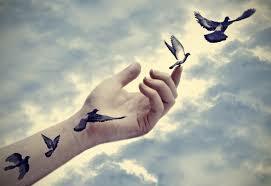 Letting go of the fear of embracing my free will and gaining liberty. This relates closely to the fear of being alone and the desire for other peoples approval. Letting go of the desire to be accepted as one is. This also relates closely to the fear of being alone as well as an individuals sense of identity which is often derived from how other people define them. Letting go of the desire to be respected by every person and accepting that many people are not capable of understanding me. Letting go of the fear of being wrong and and seeking a sense of comfort and security in someone elses ideas of what’s right and what’s wrong. Letting go of the desire for things to be within my control, or my perception of what it means to be in control and the satisfaction in feeling a sense of power over ones circumstances.